Use a knee scooter rental for safe injury prevention and fast mobility recovery. With our knee walkers, you can scoot around and get where you need to go, while still being able to safely recover from an lower leg injury. 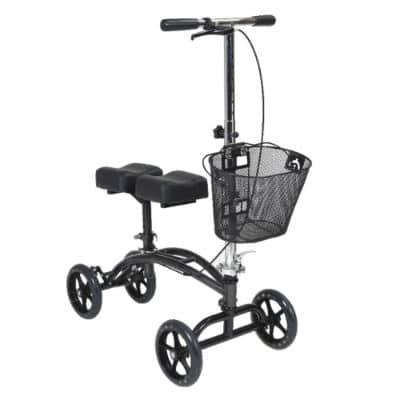 They are a much better alternative to using crutches and have a great turning radius for getting around. Travel safely and rent one today, also known as a knee caddy. Renting an orthopedic knee caddy with One Stop Mobility is easy. Simply call us at (602) 493-0509 to make a reservation or fill out the online request from below, and a representative will get back to you to finalize the booking. Yes. We charge a one time $45 delivery fee that includes both delivery and pickup. We deliver to all the surrounding hotels and residences in the Arizona valley and to all surrounding locations such as Scottsdale, Chandler, Gilbert, Mesa, Peoria, and wherever else you may be staying. Alternatively, you can schedule an office pickup and return at no charge. If however, you can’t pick up from our office, simply let us know and we’ll arrange a date and time for your delivery and pickup. Renting a knee caddy has never been easier! Can I Steer it Outside? Yes. The caster wheels are designed for both indoor and outdoor use. All of our knee walker models can be steered and driven outside, making them practical and efficient for day-to-day tasks. They can fold and fit inside your car for easy transportation and be taken with you on the go. Are the Specifications the same for all Knee Walkers? Product models may slightly vary based on product availability. One Stop Mobility reserves the right to rent out different models with similar specs based on available equipment inventory.